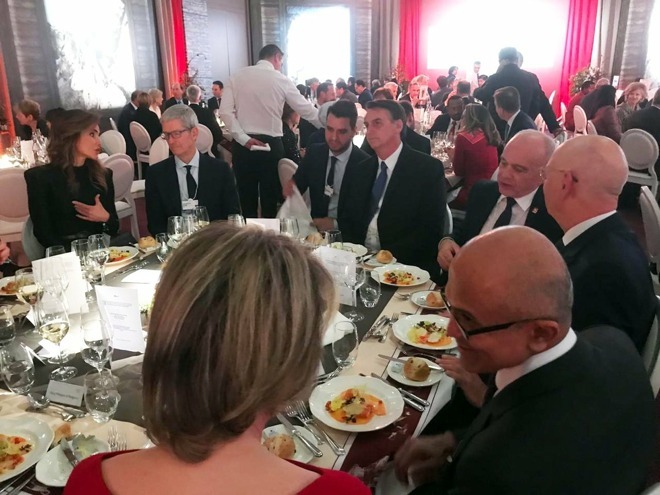 Other people at the table included Swiss President Ueli Maurer, New Zealand Prime Minister Jacinda Ardern, and members of the Belgian royal family, according to a photo shared on Twitter. Davos offers an opportunity for corporate and political leaders to mix as they discuss the future of the planet. Bolsonaro is an extremely controversial figure in and outside of Brazil, a leader who has not only opposed immigration and environmental regulations but defended torture, and the former military dictatorships of Brazil and Chile, even arguing they should have killed more people. It's unknown what sort of discussions Cook may have had with Bolsonaro or other leaders. Private talks at Davos are rarely made public. Brazil is an important market to Apple as the biggest country in South America. The company has retail stores in Sao Paulo and Rio de Janeiro, and launched Apple Pay there last year. Import costs tend to make Apple products expensive. Assembly partner Foxconn did make a short-lived run in the country, but pulled out partly because it was counting on money from a private investor and the Brazilian government, the latter of which it was hoping would cover 30 percent. Here we go again... the Left can't stand the Right, and vice versa. We're done here. Review the commenting guidelines.